We have a varied and exciting curriculum at Roe Lee School. We place great importance on making sure that the key skills in English and mathematics are taught well through interesting and enjoyable lessons. The children make very good progress in these 2 subjects. We have dedicated teachers delivering all the PE and music across the school - this means that these subjects have a high profile and are strengths of the school. This year we have been introducing the new National Curriculum which has meant some changes to the content of what we teach in all subjects. There is a link to the new curriculum below if you would like to find out more about it. Our very effective team of teachers and support staff make sure that those pupils who need extra support are given all the help they need to succeed. 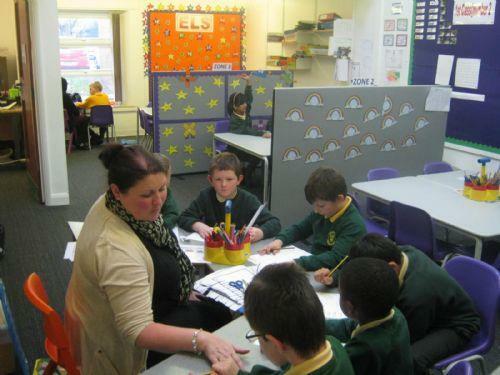 In September 2013 we opened our 'Learning Zone' - a special area set aside for the delivery of key interventions such as 'Reading Recovery' to improve reading skills and 'First Class at Number' to improve maths skills. Our 'Learning Zone' in action! We have regular events, school trips and visitors to school to enhance our curriculum and a wide range of extra curricular clubs on offer such as football, rugby, cookery, choir, cross country / athletics, 'sporty police' and many more! These are usually free of charge and are very well attended.